Three simple ingredients is all you need to make this delicious, all natural and kid approved Honey Peanut Butter. For me, I don't like to buy anything at a grocery store that has a paragraph of ingredients, ingredients that I can't pronounce, high fructose corn syrup and chemical preservatives. 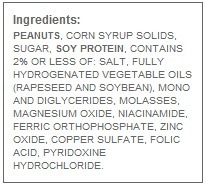 Ingredients for some store bought peanut butter, yikes. Roasted and salted cocktail peanuts, sometimes they are called party peanuts, gives it the roasted and salty flavor that you are used to from the store bought. Make sure to check that it only has peanuts, oil and salt. No other spices or sugar. Local honey may cost a little bit more than the honey in the little bear but if you have seasonal allergy it may help with them, you know it's pure honey and not cut. Also local honey is richer in flavor and thicker than manufactured. Use an oil that won't add any flavors to the peanut butter. Coconut oil can also be used but not the solid form, it will make it not spreadable. You might want to go through the peanuts in a bowl or on a plate to check for any extra burnt peanuts. I found some in mine and it might through off the taste. Pour peanuts into the food processor to the liquid line. Do not over fill the food processor or cover the top of the blade. Pulse the peanuts 10 times to look like small rubble. On low, blend for 3 minute. It will first look like a thick paste. Add a tablespoon of oil and tablespoon of honey then stir it then blend again for another 3 minutes. Stir around and blend for 2 to 3 minutes. Don't freak out if it starts to form into a ball, just add a little oil, continue blending and it will smooth out. Add oil, honey and stir then blend until it's creamy. For crunchy, fold in the chopped up peanuts. Blending may create heat so let it cool for maybe 5 minutes before storing. Repeat the same processor for the rest of the peanuts. Transfer peanut butter to the mason jar and store in refrigerator. Make cinnamon peanut butter just add 2 to 3 teaspoons of cinnamon. Enjoy it on a sandwich, on a spoon, or make cookies with it. May have to take it out for 5 or so minutes before use, to make it easier to spread. The oil may separate just stir it with a spoon. Please go to my Facebook page and give it a like. Subscribe to get notifications when I post new recipes. I adore peanut butter, in fact I live for it but I like the sound of the honey version. Honey is so good for the immune system. Yes, especially local honey will help with seasonal allergies. Once I tried but was quite unsuccessful :-(. Now I'll try to follow your recipe step by step. If I succeed I'll let you know ok? what a mouth-watering peanut butter. With the help of your blog I'll try to make it and eat it. Sounds delicious! My kids love honey and peanut butter. I bet this would be fantastic as a dip for fresh apples and bananas. I have yet to try that way but I have baked with it and it came out great. How yummy!!!! And I agree with you on store bought! If I can make it at home I'm happy! Another plus on making it at home is that you can make so much more than buying at the store and won't cost an arm and a leg.